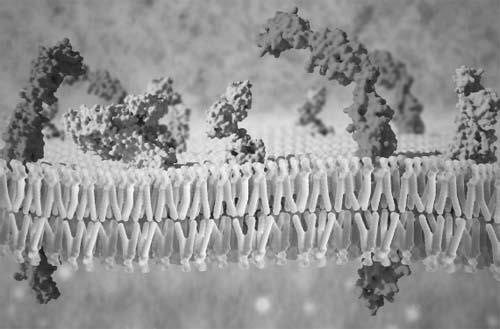 What is a lipid bilayer? Lipids are important in cells as they form bilayers that protect the cells and hold them together. In a lipid bilayer, the nonpolar tails gather on the inside of the bilayer, allowing the polar ends of each lipid molecule to interact favorably with the polar, aqueous environment of the cell and its surroundings. Within a bilayer, the lipid molecules can still slide around and can even flip from one side of the bilayer to the other. Lipid bilayers generally don’t allow molecules or ions to pass readily, allowing for the buildup of concentration gradients between the cell and its surroundings. Lipid bilayers are also found elsewhere; for example, they can also form separate compartments within cells. In a lipid bilayer (the layers in the middle that look like rows of clothespins), the nonpolar tails gather on the inside of the bilayer, allowing the polar ends of each lipid molecule to interact favorably with the polar, aqueous environment of the cell and its surroundings.